Though — contrary to common belief — today is not Mexico’s Independence Day, it’s still an excuse to celebrate. And here at The Penny Hoarder, you know how we celebrate: with deals. So here are 10 of the best Cinco de Mayo specials we could find… Vamos! To celebrate Cinco de Mayo, Applebee’s is extending its Dollarita promotion and adding on a deal for $2 Dos Equis, or “$2 Dollar Dos”, from May 1 through May 5. Get your drink on with $5 handcrafted classic margaritas at the Bahama Breeze nearest you. If you’re planning ahead, this deal is valid now until May 5, but is not available after 9 p.m. in Ohio and Virginia. You may not be able to think of anything but shrimp when you hear or see the words “Bubba Gump,” but this popular seafood chain is joining the Cinco de Mayo fiesta with $1 tacos and $4 Corona bottles all day long. Tex-Mex chain Chuy’s starts the Cinco de Mayo celebration early. Stop by the Austin, Texas-based chain Friday, May 4 for a $1 floater (a half-ounce of your favorite liquor poured over your beverage) or $1 off Coronas from 4 p.m. to close. On May 5, enjoy all-day happy hour specials, plus the previous day’s drink offers, and on Saturday, May 6, get a hangover cure with $5 bloody marys. If you’re planning on partying from home, you can save on catering meals at El Pollo Loco. Get $10 off a 24-piece catering meal with coupon code 9781, or $20 off a 48-piece catering meal with coupon code 9792. The coupon codes are valid May 4 and May 5, and if you’re a Loco Rewards member, you’ll also receive double points for both offers. Cinco de Mayo doesn’t exactly scream pizza, but if you get the craving for pizza instead of tacos and have a few mouths to feed, then grab up this deal from Hungry Howie’s. Purchase a large one-topping pizza and get additional one-topping large pizzas for $5.55 each with coupon code CINCO18, valid May 1 through May 5. 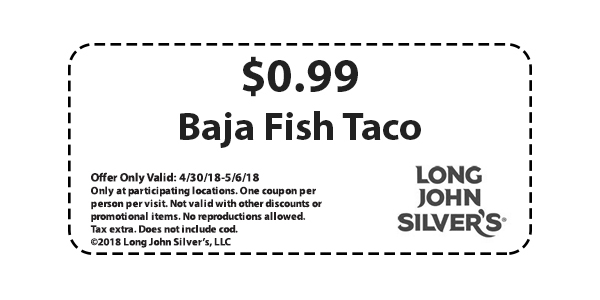 If you’re a fan of fish tacos, you can get them for just 99 cents at Long John Silver’s. Just bring this coupon to a participating location any time through May 6. This quick-service Tex-Mex chain is offering $5 burritos all day at select locations — and if you’re one of the first customers of the day, you might even get a free T-shirt! And if you’re planning a party, all of your guests will receive a $5 digital Moe Buck when you order catering for 20 or more people. Drink specials abound, with $5 margaritas on Cinco de Mayo Saturday. To get the fiesta started, many locations will also have live music. Get three days of $2 deals on Cinco de Mayo weekend. All Tijuana Flats locations are offering $2 tacos and $2 Mexican beers from May 4 to May 6. You may even get to smash some pinatas and enjoy live music, depending on the festivities planned at your nearest location. Check out this list of location-specific fiesta events. Be sure to check out your local restaurants to find more deals for Cinco de Mayo! As a bonus, here’s how to save money on booze you may want to (responsibly) consume this weekend. Jessica Gray is an editorial assistant at The Penny Hoarder. She contributed to this post.